In addition to plans to grow or maximize the earnings of the business, every business owner should have a long range plan for the ultimate disposition of the business. Small private companies, often referred to as “family businesses”, are quite often transferred from one generation to the next. However, the focus of this article is the sale of a family business to an outside third party and the steps that the business owner should take, well in advance, to maximize the benefit of the sale. The decision to sell a business is often not planned but is, rather, the result of a convergence of circumstances (emergence of a motivated buyer or health concerns of the owner). These opportunities are generally time sensitive and usually do not allow the vendor of a family business to organize the company’s affairs in a manner which could maximize the sale price or reduce the taxes payable on the sale transaction. Every prudent business owner should consult with his/her lawyer and accountant once it is clear that, for whatever reason, the business will not be transferred to the next generation. The business owner will be advised as to how to plan and structure its business affairs in order to take advantage of strategies designed to maximize the net return on the sale of the business. 1. Capital Gain Exemption – The gain on the sale of shares in a Canadian controlled private corporation (“CCPC”) may be partially or wholly exempt from capital gains tax. Since most CCPC’s are started with minimal contribution of share capital, the gain on the sale of shares of a successful company could be substantial. If the shares are “qualified shares” as defined in the Income Tax Act (the “Act”), the first $500,000.00 of the gain (or the unused portion of this lifetime exemption) is exempt from capital gains tax (a current tax savings of approximately $120,000.00). For the shares to “qualify” however, certain tests, prescribed in the Act, must be satisfied. These are referred to as the “90/10 rule“ and the “50/50 rule” both of which are designed to restrict a shareholder from selling a business containing non-active business assets (casual investments and cash) and to increase the gain on the basis of the business owning such non-active business assets. In order to satisfy the “90/10 rule”, the owner/shareholder could distribute the non-active business assets (by bonus or dividend) immediately prior to closing of the sale transaction. However, the “50/50 rule” requires that the corporation’s assets consist of not greater than 50% non-active business assets for a period of two years prior to the sale. A financially successful business will often accrue retained earnings, which could put the corporation offside of the “50/50 rule”, unless appropriate steps are taken well in advance of the sale. Accordingly, steps should be taken to distribute non-active business assets in order to “sanitize” the company at least 2 years prior to a possible sale of the business. 2. Freeze techniques to Enhance the Capital Gains Exemption – Freeze techniques are often used to place growth shares in the hands of family members without triggering “attribution“ to the original shareholder. In a simple freeze, the common shares (the “growth” or “equity”) are exchanged for preference shares with an aggregate redemption value equal to the fair market value of the common shares. Once that is achieved, family members can subscribe for new common shares at a nominal price - there is no equity attributable to these common shares until the value of the company exceeds the frozen value of the preferred shares. If the company continues to grow, the original shareholder and each family member who subscribes for common shares after the freeze may then have the opportunity to utilize the capital gains exemption (capped at $500,000.00) provided that the shares qualify. The earlier that the original shareholder freezes the growth shares, the greater the opportunity for family members to benefit from the growth in the newly-issued common shares. Additional matters to consider when preparing a family business for sale will be discussed in the January 2006 issue of The Fine Print. On July 30, 2005 the new Consumer Protection Act, 2002 (the “CPA”) came into force in Ontario. The CPA replaces the former Consumer Protection Act as well as other consumer-related legislation. The CPA applies to transactions between suppliers (i.e. businesses) and consumers where either the supplier or the consumer is in Ontario at the time of the transaction. Consumer agreements must now be prepared in accordance with the requirements of the CPA in order to be binding. Further, parties cannot waive or contract out of their rights under the CPA. Nonetheless, in certain circumstances, a court may determine that it would be inequitable for the consumer not to be bound to an otherwise non-compliant consumer contract. A review of some of the more salient provisions of the CPA are discussed below. Under Part II of the CPA, consumers have the right to have a dispute resolved through the Courts. Many consumer agreements attempt to deny consumers this right by providing that the parties agree to resolve disputes solely through arbitration, a costly method for minor disputes which would be better resolved through Small Claims Court. The CPA recognizes this and protects consumers accordingly. any ambiguity in a consumer agreement or in mandatory disclosure information provided to the consumer is to be interpreted to the benefit of the consumer. Part IV of the CPA deals with specific consumer agreements, namely future performance agreements (where delivery, performance or payment in full is not made when the parties enter the agreement), time share agreements, personal development agreements (gym memberships, dance lessons, etc. ), internet agreements, direct agreements (negotiated/ concluded in person but not at a normal place of business), and remote agreements (agreement entered into when the consumer and supplier are not present together). The regulations under the CPA set out the specific requirements for each of these types of agreement. Failure to meet these requirements could result in an unenforceable agreement or extended rights being granted to the consumer. Cooling-off periods, for consumers to change their mind, have been increased or now exist where they have not in the past. Consumer agreements must be in writing and cancellation rights exist for the consumer if copies of such written agreements are not provided to the consumer within a prescribed time. It would be prudent for any supplier or service provider to ensure that its consumer agreements comply with the new requirements of the CPA. This is the first of a two-part series on the Consumer Protection Act, 2002. Part 2 of this article will appear in the January 2006 issue of The Fine Print. Christopher Neufeld has joined us as an articling student. Christopher spent the past five years practicing corporate/ commercial law in New York and has returned home to practice in Ontario. Debi Sutin spoke on the topic of “Franchise Agreement Drafting” at the Ontario Bar Association’s 5th Annual Franchise Conference, held in Toronto on September 21, 2005. On September 15, 2005, Cam Neil attended the 51st President’s Dinner of the Oakville Chamber of Commerce on behalf of FDH, a proud and continuing member of the Chamber. 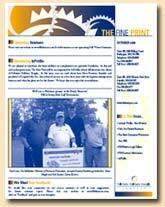 We are pleased to introduce the latest addition to complement our quarterly Newsletter. In this and each subsequent issue, The Fine Print will be accompanied by InProfile, which will showcase the clients of Feltmate Delibato Heagle. In this issue, you can read about how Peter Reaume, founder and president of Logisti-Solve Inc., has achieved success in a few short years with his logistics management business and what his plans are for the future. We hope that you enjoy this new addition.